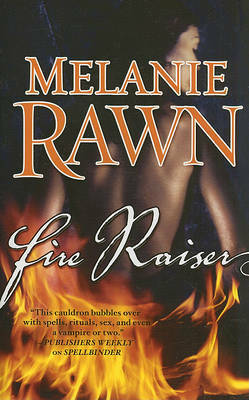 Bestseller Melanie Rawn plunges down the back stairs of the old South into a dark world of family secrets and the international flesh trade that lies underneath the surface of small town politics and romance.Holly McClure and Evan Lachlan have survived the fiery beginning of their romance and left Manhattan for Holly's ancestral home to raise their children. Evan's the county Sheriff; Holly is still a trouble-making Spellbinder trying to manipulate her family as if they were characters in one of her novels.But something's not right in Pocahontas County. Churches are being burned down in mysterious arsons with a taint of magic on them. Sheriff Lachlan suspects that they have something to do with the new owners of the old Westmoreland plantation, now a very upscale Inn, but even if he could find proof, it's going to be hard to bring a case of Black Magic before a Judge -- even in Pocahontas County, where witchcraft is the family business of all the oldest clans. Melanie Rawn is the author of "Spellbinder," "The Ruins of Ambrai," and "The Mageborn Traitor." Rawn lives in Flagstaff, Arizona.